The Goki nature cement mixer is just like the real thing, with turning wheels and a rotating concrete barrel! 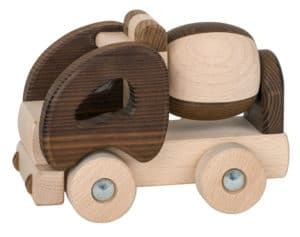 Made from solid timber that is thermally treated to produce the varying colours without the need for chemicals, it would make a great neutral addition to any nursery or toy collection. A timber classic that will ignite any little construction worker’s imagination. Role play is an essential part of children’s learning and this life-like cement mixer is bound to go on many adventures with your little one.